Exocet is small time runner who specializes in hacking. 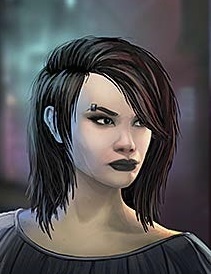 She strives to keep a low profile, having seen a number of prominent Mars City runners get offed over the last few years. She figures it’s better to stay safe and get some steady pay, rather than shooting for that one big score that never quite seems to happen. She occasionally team up with Rooster, an Irish smooth talker who’s pretty new to town, although even he knows little about her.